With his SENNEBOGEN 825, operator Martin Tausch can make a quick choice between the multi-shell grab or the scrap metal shears at any time. The material handler is equipped with a quick-action coupler that makes it a highly flexible and multifunctional tool. 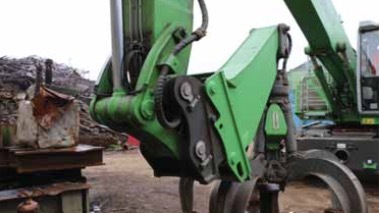 It is used to handle scrap at the yard of customer Schenker in Hohenkammer. As a certified disposal specialist, Schenker Industrie- und Sta¨dtereinigungs GmbH takes care of the disposal and recycling of waste and all kinds of raw materials. value-added chains. Every month around 15,000 tonnes of material are handled and recycled at the Hohenkammer site, including approximately 5,000 tonnes of scrap metal, paper, waste wood, plastics and other recycling materials. In total, four SENNEBOGEN material handlers are used for material sorting, yard logistics and, in particular, loading the processing plants. The latest piece of machinery is a SENNEBOGEN 825, which, thanks to its special handling equipment, can be used with a multi-shell grab and 3-tonne scrap metal shears as well. The SENNEBOGEN 825 was delivered by sales and service partner Fischer & Schweiger at the end of 2016. It is equipped with a 6.8m boom and a 3.2m grab handle with quick-action coupler to provide a reach of 10m. The different attachments can be exchanged easily from the cab. Schenker uses both an original SENNEBOGEN multi-shell grab with a 2.1m short handle for material handling and the existing three-tonne Zato shears. To managing director Thomas Schenker, the advantages of this custom solution are obvious: “Depending on requirements, we can simply switch between the two attachments. The shears allow us to trim large steel beams and pipes for subsequent processing right after delivery. The material handler with the grab can be used for loading and sorting tasks around the entire yard wherever needed. With this set-up, we can reliably perform two tasks with just one machine”. The actual material handler is a SENNEBOGEN 825 with all-wheel-drive undercarriage, a 129kW diesel engine and an elevating cab with a standard lift of 2.7m. At the Hohenkammer site, work has to be done at frequently changing locations, so any solution has to be ultimately flexible. For example, the SENNEBOGEN 825 fitted with shears is used for preparatory work at the large 2000-HP shredder. On other occasions, the machine is used on short call to feed the processing plant or sort material using the multi-shell grab. Quickly responding to demand is no problem because attachments can be swapped in only a few minutes.